June 2007: Harley flies for charity. The lady rider is a wife and mother of two. She called in on a radio show where I donated a ride with Harley to raise money for the Children's Make-a-Wish Foundation. She was the high bidder. In May, a fuzzy baby bird Dutch Kaffel took for a duck showed up on his Frankfort front lawn. The chick still was there nibbling grass that night. Fearing for its safety, he put the bird in a box and brought it indoors. Almost five months later, the Canada goose, now named Harley, has become the talk of the neighborhood. Kaffel, a 54-year-old father of six, demonstrated why last week. He backed his gray Harley-Davidson out of the driveway, calling "hey-hey-hey-hey." 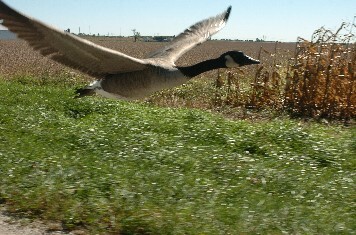 Harley the goose lifted his head, honked and waddled forward as Kaffel hit the gas. By the time Kaffel was in second gear, Harley was flying alongside the motorcycle, just a few feet off his right shoulder. The pair have traveled up to four miles this way, says Kaffel, who "flies" Harley just about every day. Harley prefers to cruise about 35 mph, but once got up to 43 mph, Kaffel says. "All I've got to do is pull out, call him and then down the road we go," he said. For Kaffel, a former boxer who grew up in Harvey and now owns a construction business, raising a goose had never been a desire. "You talk about (coming) full circle," he said. "I used to hunt duck and geese and pheasant and all of a sudden I'm raising one." A spokesperson for Harley-Davidson laughed when he heard the story but declined to comment. Wildlife experts -- who called Harley's behavior a first -- said Kaffel may mean well, but is violating federal law. "You know what, that must be neat as hell, to have that view (on the motorcycle). But it is against the law to take in a baby goose," said Jacques Nuzzo, program director at of Illinois Raptor Center in Decatur. 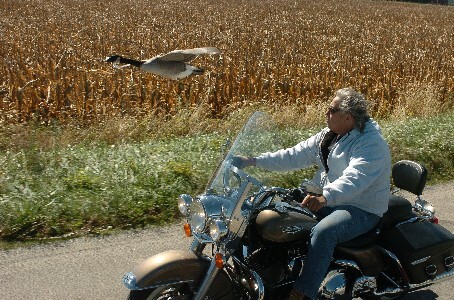 "One of the reasons is so you don't imprint them to fly along with your motorcycle, because that's not what geese do." "I know this guy had the best intentions, but in the long run, he really screwed the goose over." Nuzzo explained that soon after gosling hatch and develop vision, they "imprint" on their caregiver. When the bird matures, it will want to mate with the same species it bonded with as a chick -- in this case, a human. For that reason, the bird cannot be returned to the wild, Nuzzo said. But other geese lovers defended Kaffel. They say he rescued a bird that may have otherwise died. "I think they are wild birds, but to each his own," said Margaret Love, a Winnipeg woman who in April started a Web site, www.lovecanadageese.com, that is a forum for goose fans. "They seem to have a love for Harley, so why can't he stay? Who's to say that that's the wrong thing?" Kaffel said he only wants what is best for the goose. He says he's resisted calls by friends and others to take Harley to Hollywood. The only time the bird is inside is at night, when he beds down in a large dog cage. 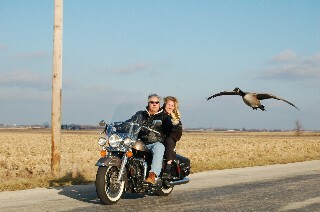 Once, though, the family watched "Fly Away Home" with Harley. It's a movie about a teenage girl who, with help from her father, teaches some orphaned geese how to migrate. "We had him in the cage and put him on the coffee table. 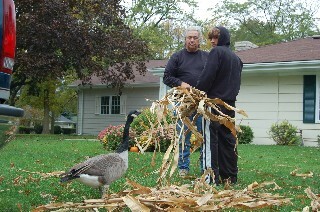 In the movie, when the geese got old enough that they started honking, he'd stick his head up and he'd look," Kaffel said. "As soon as the honking was over, he'd go back to cleaning himself." Kaffel hopes Harley will join a flock when mating season comes next spring. And he still wonders how Harley ever came to his doorstep. "It's a mystery we will never know," he said. The Kaffel family is saddened by the loss of our beloved family member Harley. He was a member of our family for 10 years and 5 months. He passed away today at 11am at a animal care facility where he was being treated He will be greatly missed.